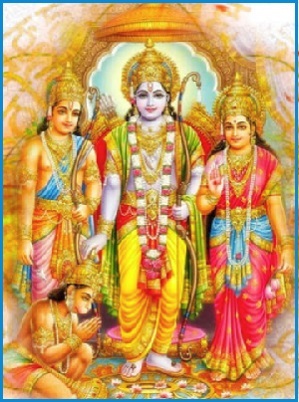 Rama Navami or Sri Rama Navami is a spring Hindu festival that celebrates the birthday of Bhagwan Rama. This is a major festival in Hindu culture. This festival is celebrated on the 9th day after Amavasya i.e. no moon day in the month of Chaitra. This day falls in either March or April of the Western / Christian Gregorian calendar. Ramayana is an Itihasa or history in Hindu civilization. There are two major Ramayanas, one is written by Valmiki in Sanskrit language and Valmiki was a contemporary of Bhagwan Rama. The other famous Ramayana is by Tulsidas which is in the common person’s Awadi dialect of Hindi which was finished in 1576 AD. The Rama Navami celebrations are done grandly with participation in large numbers across several Devalayas across India. The most famous of these happen at Ayodhya (Uttar Pradesh), Sita Samahit Sthal (Sitamarhi, Bihar), Janakpurdham (Nepal), Bhadrachalam (Telangana), Kodandarama Temple (Vontimitta, Andhra Pradesh) and Rameswaram (Tamil Nadu). Ayodhya is the birthplace of Rama and on occasion of Rama Navami tens of lakhs of people arrive in Ayodhya seeking blessings and to honor the traditions. Large fairs are held to mark this occasion. Chariot processions referred as Rathayatras and also known as Shobha yatras of Bhagwan Rama, Sita, his brother Lakshmana and Hanuman, are taken out in the temple towns. Which get massive participation from public. On this day, many temples conduct a wedding anniversary of Bhagwan Rama and Sita Devi referred as Kalyanotsavam. Almost every single Indian village has a Hanuman temple and for Sri Rama Navami the various activities including shoba yatras or rath yatra, Kalyanothsavam, Havans and pooja ceremonies are conducted. On this day recital of Ram Kathas or reading of Bhagwan Rama life events are done extensively. In urban India even outside temples many housing societies, colonies celebrate this festival with Havans, Pooja, rath yatras, kalyanothsavams and recital of Ram Kathas. Bhagwan Rama had travelled extensively in his lifetime. The various events at the geographical locations are marked by temples and landmarks. Bhagwan Rama’s travel with Sage Viswamitra, vanavas during which travel to Sri Lanka and back was done, travel to Himalayas for penance and other events. In Hindu traditions, Ramayana is itihasa or history for a strong reason. Almost all the major event locations are traceable even today. Bhagwan Rama’s birthplace, Seetha Devi’s home town, the bridge across Rameshwaram for Bhagwan Rama’s Army to cross the sea to Lanka and thousands of Ramayana event locations are current tourist landmarks. People nearby such places visit the places for pilgrimage and inspiration. The life of Bhagwan Rama and Seetha Devi marks the transition of civilization. The life of this divine couple was not without difficult circumstances but they always stood for right conduct or maryada in difficult times. The moral superiority of performing right conduct was emphasized over the power of the mighty. They gave in society importance to protection of the weak who are morally right. This was a mighty emperor who always followed maryada even when it was unpleasant and the path was difficult. Bhagwan Rama was Maryada Purshotama, one who diligently followed maryada. Although Bhagwan Rama had all the power in the world, he was peaceful and gentle. Through careful examination of Bhagwan Rama’s life, we learn how to be the perfect son, the perfect brother, the perfect husband and the perfect king. His reign in Ayodha is referred to as Ramarajya, the epitome of good governance. This entry was posted on Apr 2019 at 5:00 PM	and is filed under Information, Uncategorized. You can follow any responses to this entry through the RSS 2.0 feed. Your Feedback Matters!